Aside from the tempting airfares rolling into our inbox every other day, the prospect of a holiday to Canada or the USA just got even better for travellers looking to tick off their bucket list destination in 2016. 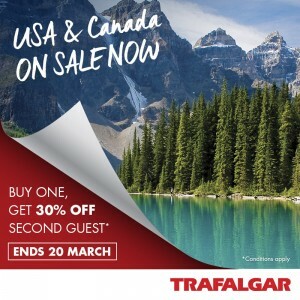 The global leader in guided holidays, Trafalgar, has released another ‘one week-only’ special, extending its ‘buy one, get your travel partner 30% off deal’ on 20 of its best-selling departures from its 2016 The Americas programme. Just because the Australian dollar is lower against the US dollar, it doesn’t mean you can’t have a great value trip. 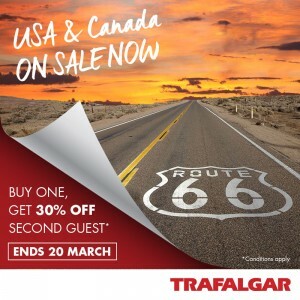 Lucrative airfares paired with Trafalgar’s USA and Canada flash sale means clients can take advantage of incredible value-for-money holiday experiences. For example, clients can save up to $1095 when they book a travel partner on the 10-day Tastes and Sounds of the South guided holiday or up to $3105 when they book a companion on the 27-day Trans-American Grand Adventure. Not only are they saving money, but all trips include quality accommodation, most meals including breakfast daily, exclusive Be My Guest experiences and Local Specialists and Cultural Insights throughout, giving them a deeper understanding of the destination they wouldn’t have known if travelling on their own. Canada is fast becoming the go-to destination for solo travellers. During 2015, Trafalgar noted an 18% increase in females travelling solo on its top-selling Best of Eastern Canada guided holiday compared to 2014, and 2016 is set to fair even better. During Trafalgar’s flash ‘one week only’ sale, solo travellers can take advantage of 15% off savings on a selection of holidays to Canada including the Best of Eastern Canada (save up to $524), Spectacular Canadian Rockies (save up to $563), Iconic Rockies and Western Canada (save up to $758) and Enchanting Canadian Maritimes (save up to $596). Yes, clients will want to see the Empire State Building, view the White House and visit the majestic Niagara Falls when visiting USA’s East Coast; but Trafalgar knows it’s the experiences they never would have thought of doing that become trip favourites. When travelling on the 14-day East Coast USA and Canada guided holiday, clients will have the chance to stay at two Authentic Accommodation properties – The Inn at Leola Village in Pennsylvania dating back to the 1800s; and the Omni Parker House in Boston renowned for its legendary ‘Saturday Club’ and attended by brightest minds of the Golden Age of Literature and national politics including Emerson, Thoreau, Hawthorne, Roosevelt and John F. Kennedy. They’ll enjoy an exclusive evening at a family-owned winery following their visit to Niagara and taste award-winning wines including ice wine – a local specialty to the region and only produced in a few areas of the world; and learn about life in an Amish Country with a Local Specialist. There’s something for everyone… literally everyone! The great thing about travelling to USA or Canada is that there is something for everyone. Whether your client is a history buff, an adventure-seeker, festival goer or simply want to plan a family holiday, both destinations offer a range of activities suitable for all ages. 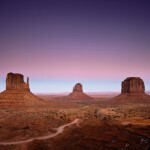 Trafalgar’s Route 66 guided holiday is the perfect combination of everything. On its 90th anniversary, travel America’s famous highway from Chicago to LA hitting all the ‘bucket list’ stops along the way. From staying at the nation’s oldest continuously operating hotel, The Palmer House Hilton, to making BBQ sauce with former USA BBQ champions and meeting first responders and survivors from the 1995 Oklahoma tragedy, your clients will experience simply the best of America from East Coast to West Coast. In the wise words of Jarod Kintz, “Wisdom is knowing when you are being patient, and when you are wasting time by waiting.”If your clients are contemplating travelling to The Americas in 2016, now is absolutely the time to book. With savings of up to $3105 valid for one week only, it’s a subtle reminder that nothing haunts you more than the things you didn’t buy – especially when on sale! Remember, all bookings made between now and 30 April, 2016 will put you in the running to win a share of TTCs $1million dollar cash giveaway.